Spinoffs usually go one of two ways. Most of the time, they’ll only appeal to a very specific audience, and will fail to reach a broader consumer base they may have been designed for. On a rare occasion, a spin-off will have mass appeal and become a critical success. Some spinoffs have ‘gone the distance,’ so to speak. The Mario Party series of games from Nintendo is one such spinoff; a franchise spun-off from a franchise. Its cousin Mario Kart has a similar story. 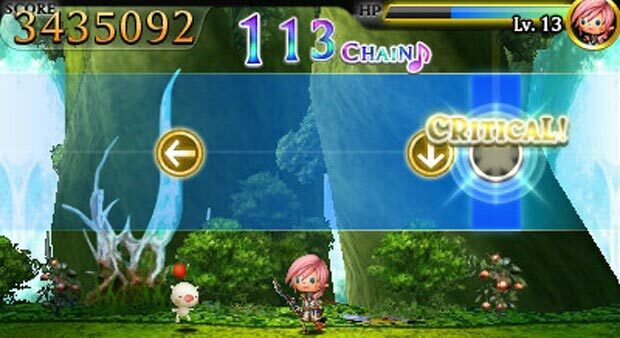 Theatrythm Final Fantasy is a rare case–it’s a well-designed video game with plenty to do and tons of unlockable content. However, unless you’re a Final Fantasy fanatic or a diehard fan of the long-dormant rhythm genre of video gaming, Theatrythm will fail to keep your interest long enough to justify a purchase. 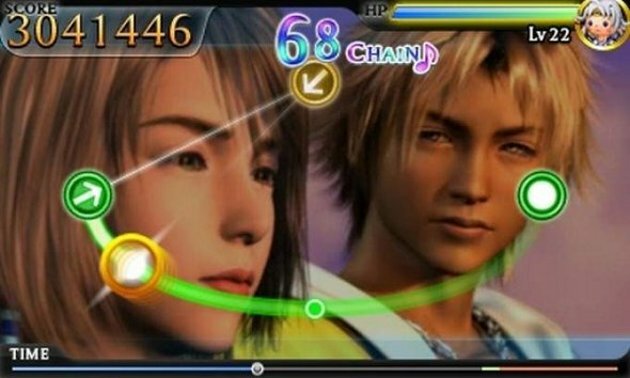 The game could have been called “An Interactive Musical History of the Final Fantasy Series”–in fact, the title may have been less convoluted that way. Theatrythm Final Fantasy is a ‘spiritual successor’ of sorts to the Dissidia Final Fantasy series of fighting games. Theatrythm is, as you may have suspected, a rhythm game. The premise is quite simple–there are three different modes of play, which all boil down to tapping the 3DS’s bottom screen in time with the song being played. 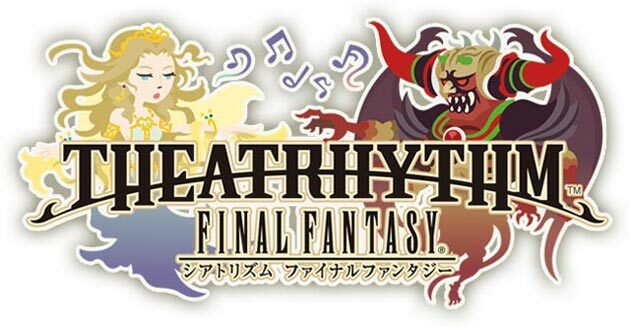 Fortunately for Theatrythm, the Final Fantasy series’ musical history is about as rich and beloved as it gets. There are over fifty tracks from the twenty-five years of the franchise’s life. Some are iconic pieces of music to the gaming industry as a whole–not just the Final Fantasy brand. Gameplay, as mentioned above, is incredibly simple. As with the rest of the rhythm genre, you’re required to interact with the game when markers moving from one side of the screen land on a certain spot on the other side. In Theatrythm there are a few different types of markers; some that require you to just tap the screen, some that require you to hold the stylus down on the screen until you’re indicated to release, and some with various directional arrows, requiring you to move your stylus in the indicated direction. There are three different types of music stages, each one featuring a different kind of song. These are Battle Music Stages, Field Music Stages and Event Music Stages. Each numbered Final Fantasy game from I to XIII has at least one of each. For example, representing FFV’s battle music is the iconic ‘Battle on the Big Bridge,’ while FFVIII’s world map music, ‘Blue Fields,’ is featured for the game’s Field Stage. What keeps Theatrythm from becoming a bore is how gameplay ‘shifts’ between each type of stage. 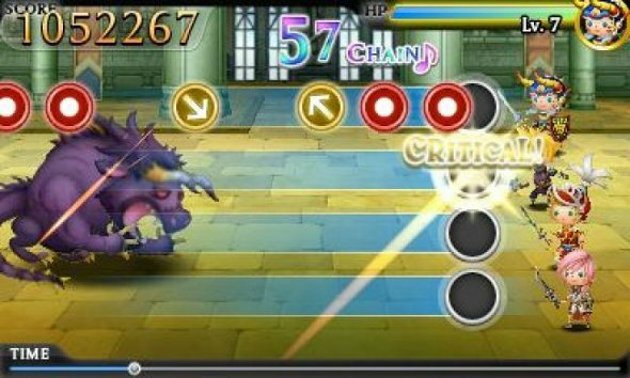 Probably the most ‘standard’ format of gameplay in Theatrythm is during Battle Stages. Markers travel from left to right, in four rows. When each marker lands on the ‘landing zone’ found off to the right, you tap your screen in one of the three ways mentioned above. What makes Theatrythm unique is the goings-on in the background in each stage. During Battle Stages your party of four characters (initially each main hero from FFI-XIII is selectable) is locked in combat with enemies and bosses from throughout the Final Fantasy series. This isn’t just a cosmetic feature–your characters level up, have stats, and can use/learn abilities and equip items. Field Music Stages feature your lead character walking through a field, with markers no longer being confined to four rows. Event Stages mix things up quite a bit. Instead of having markers float across the screen, the ‘landing zone’ travels along a set path, and you must tap the screen when the zone and markers align. During these stages, a movie is shown, featuring highlights from whatever game’s song is being played. Theatrythm contains a surprising amount of depth. The RPG elements found in leveling up and developing your characters give the game a good amount of playability. However, unless you’re a fan of the Final Fantasy series, this doesn’t count for much. The three different variations on rhythm gaming are also key as far as providing depth goes. Shifting between each type of stage keeps you on your toes and prevents Theatrythm from going too stale too quickly. There are several unlockable characters found through obtaining eight ‘crystal shards’ of a particular color. There’s at least one character from each game to unlock, with Final Fantasy IV and VII having two. Theatrythm also has the 3DS’s first pieces of downloadable content. As of this writing, there are twelve tracks available through an in-game store. The 3D function in Theatrythm is actually quite useful. I found myself using it through most of my time with the game; it really helps to differentiate the activity in the background from the markers you need to pay so much attention to. The sound quality is crystal clear–which is absolutely necessary, given the nature of the game. There were a few things I was not impressed with, however. The entire game felt like a mini-game. As I spent a few hours going through Theatrythm’s harder levels I thought, ‘so when does the actual game begin?’ There is no real story; it is best to ignore the small semblances of a plot provided at the game’s outset. For an entire franchise built upon masterful storytelling ability, this felt like a major letdown. The type of marker that requires you to move your stylus in a certain direction can be tricky. The game outright tells you to not ‘flick’ your stylus in one direction, but rather move it across the screen. Ignore that. It works much better when you do flick. I personally wasn’t a fan of the art direction. Everything is ‘cutesy.’ done in a Japanese style of animation called ‘chibi.’ However, it does go to establish the lighthearted nature of the game, so I can’t really complain too much. Theatrythm Final Fantasy is a completely unique game. The developers took a world-renowned franchise and threw it into a recently unpopular setting, and frankly, it worked. However, this game is a total love letter to longtime fans of the Final Fantasy series. Unless you’re a series vet or a fan of rhythm games, there’s simply nothing to enjoy about Theatrythm. I haven’t played Theatrythm, and I don’t think it would be my cup of tea, but as you say, die hard fans will likely appreciate the trip down memory lane. I’d love to hear what others think of the game. Nice review Chris! I figured this game wouldn’t be a smash hit. However, I love rhythm games and Final Fantasy games, so I’ll mark this one on my ‘Need To Play’ list. I love this game so far, though I am dissapointed they chose not to include a soundtrack cd with the game.. i would have paid extra for that. The cloest game i can think off to it are the Elite Beat Agent games from the DS though this lacks the comical human and charm of that making it purely for fans in most cases though given it’s cheap RRP over in the UK at least I would expect that minor fans with a passing interest will pick it up to. I’m also happy for the DLC option as so many of my favourite FF tunes got left of the the game so I have hope that they will be included in either DLC or sequels!